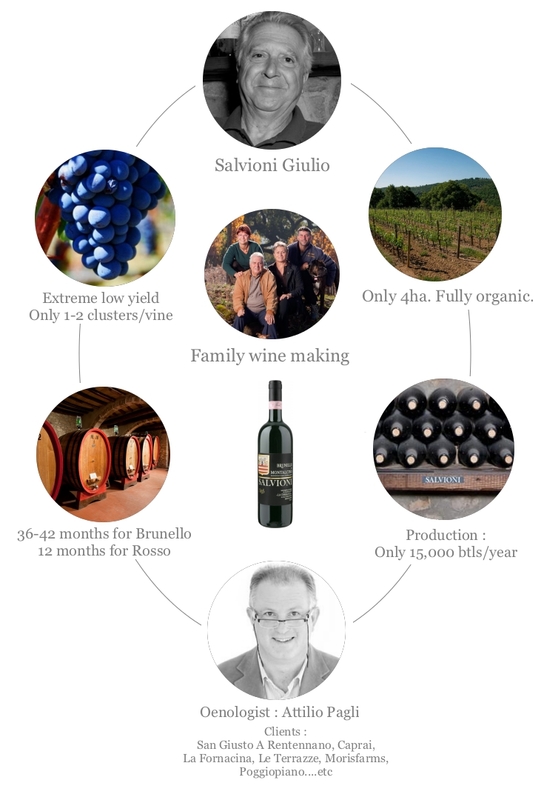 Giulio Salvioni owns 22ha land, uses only 4ha for the vineyards and he produces only 15,000 bottles without any compromise. As a result of extremely enthusiastic wine-making --- managing the vineyards by natural method, low yield(1-2 clusters/vine! ), strict selection, natural yeast, 20hl cask, aging for 3.5 years, non filtering and hand labelling!--- Salvioni produces jewelry-like black Brunello. Surrounded by woodland, the 20 hectares of La Cerbaiola look out over the Val d’Orcia from an altitude of 420 metres, opening up like a gently sloping plateau four kilometres to the southeast of Montalcino. The air is clear, a slight breeze rustles the leaves, and on the hillside opposite the outlines of Pienza, San Quirico and Ripa d’Orcia are clearly visible. There are three small vineyards for a total of 4 hectares, each with its own characteristics: soils that vary from chalky schist to stony marl; and subtle differences of micro-climate that influence the ripening of the grapes. All the work in the vineyard is carried out by hand, with hard pruning to obtain low yields of fruit and careful selection during the manual harvest. Production is deliberately limited, to obtain the very best from a unique terroir: 10,000 bottles a year when only Brunello is made; and 15,000 for the years in which there is also some Rosso di Montalcino. Following the grape harvest, fermentation and racking take place in stainless steel tanks in the cellar located just beyond the vineyards, out in the country. Once malolactic fermentation is complete, most of the future wine is aged in 20 hl Slavonian oak casks in the cellars beneath our family home, in the centre of Montalcino. Like that we feel we’re keeping an eye on it even at night, when we’re all asleep. Though the wine is actually bottled back at the Cerbaiola estate, it’s beneath our house in town that it undergoes the necessary bottle ageing before being released. Our foremost wine is Brunello di Montalcino, which has over the years won widespread acclaim in Italy and abroad. To obtain a truly exceptional wine we have adopted the traditional approach, with ageing in Slavonian oak for at least 36 months. What counts for the production of our Brunello is the quality of the harvested grapes. When climate and growing conditions do not allow for absolute excellence, we devote the entire grape crop to the production of Rosso di Montalcino, which we also make if the harvest is particularly abundant.